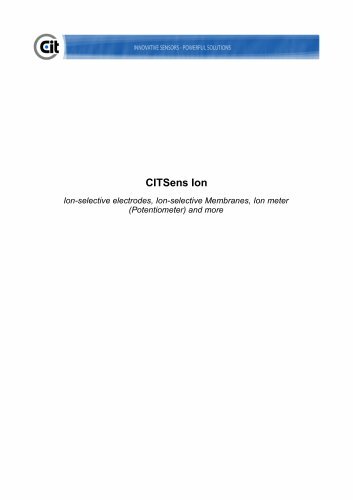 CITSens Ion Sodium (Na+) selective mini-tube electrode log K Membrane type Detection limit Polymer membrane CITSens Ion Nitrate (NO3-) selective mini-tube electrode log K Membrane type Detection limit Polymer membrane CITSens Ion mini-reference electrode Mini-reference electrode for the use together with ion selective mini-tube electrodes. The cable BNC/C6 or cable open/C6 has to be ordered separately. Liquid electrolyte: Electrode: Size: Lifetime: Upon request we are also able to produce individual ion selective mini-tube electrodes, which are not listed here. For request contact us, please.